The blackbirds in our garden have definitely done their bit to bolster the population this season. 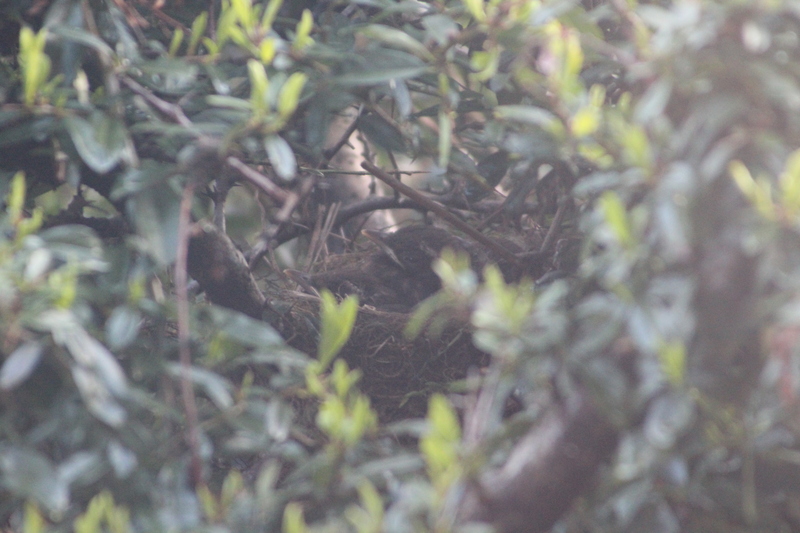 They have been nesting almost continuously for about three months. They adopted the prickly pyracantha bush in our back garden for their home. 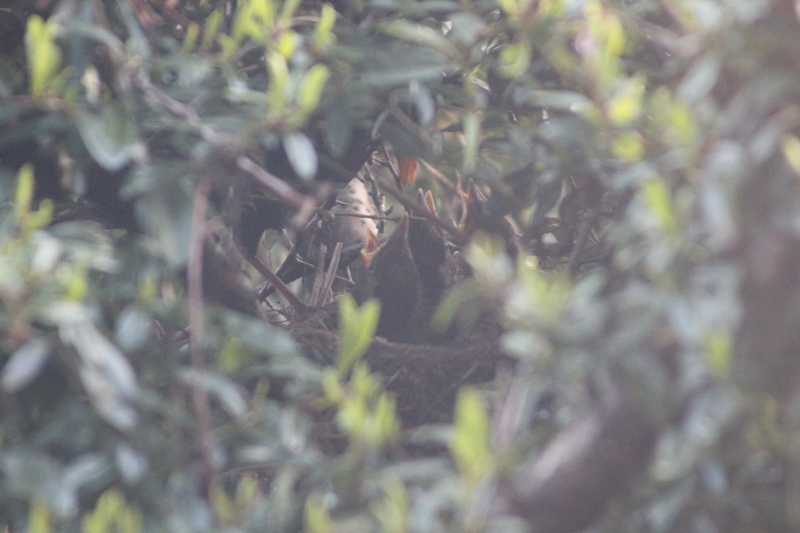 Early on, we could just see a bit of activity through a gap in the bush, but as spring continued, the pyracantha grew fresh leaves until the gap was covered. An adult on the nest. An adult brings in food. An adult checks on the babies. However, we could still see the adult birds rushing in with beakfuls of food. They were in such a hurry sometimes, they almost seemed to collide as one went into the pyracantha and the other came out. They were obviously keeping an eye out for opportunities, too, for often, they would be down very quickly after we’d put some crumbs or scraps out on the path or lawn. The male blackbird has demonstrated a lot of territorial behaviour over the weeks. We have seen him flying at collared doves and even wood pigeons on a fairly regular basis! He’s also chased off other blackbirds and he would land in the garden with his head and tail held high. Three young in the nest. We’ve seen several juvenile blackbirds in the garden this year, as is often the case. The young we’ve seen this year have been quite well developed, full-size birds but without full adult feathers. We’ve watched as the adult blackbirds have been shadowed and surrounded by juveniles if anything slightly bigger than themselves, begging for food. Despite frequently hearing young birds requesting food around the garden, the fledglings have been kept well hidden this year, until Wednesday evening. 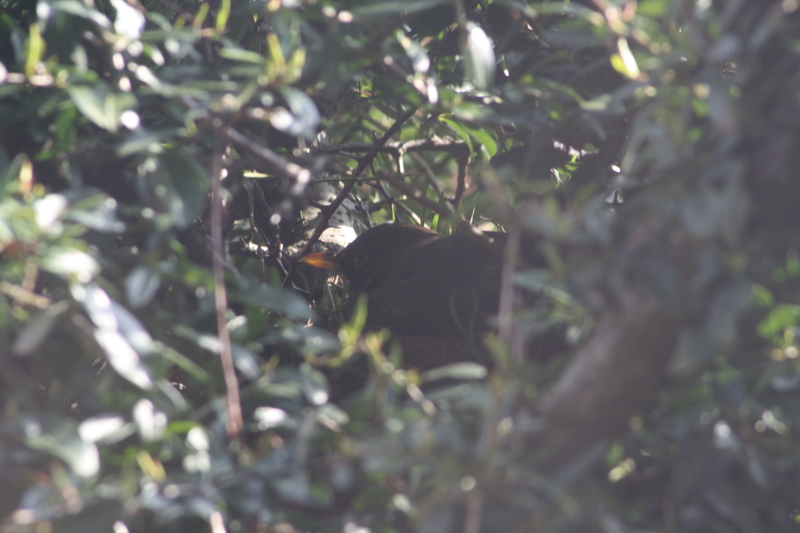 I heard a bird calling and went to the window to see a small blackbird on the window sill outside. It wasn’t the smallest fledgling I’ve seen, but certainly not long out of the nest. It had sparse hair that was spiky on its head, with a big gape and big feet! It stood on the sill making little squeaky calls. It eventually just about flew down to the area under the pyracantha, via the old lawnmower. It had stubby wings and not much of a tail. 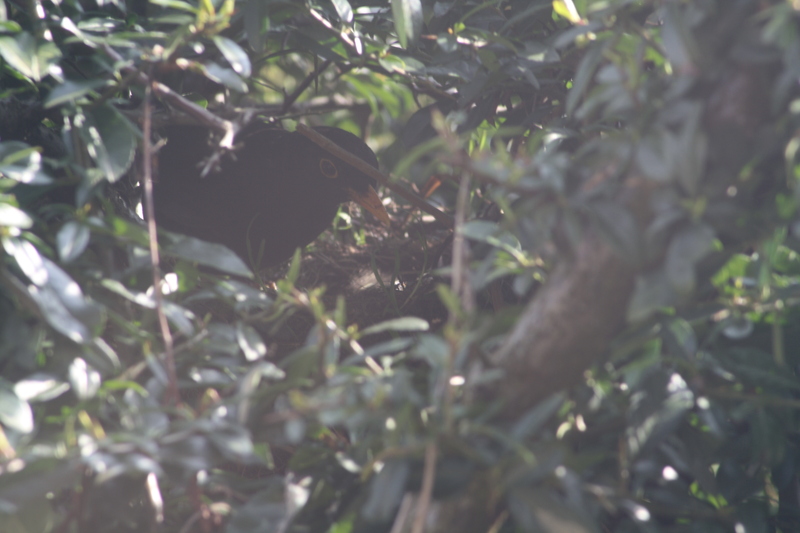 A few minutes later, the father blackbird landed nearby with a beakful of food, looked around for a moment and then went into the pyracantha. I wondered if the youngster would be told off for wandering about! The next morning, I could just see a juvenile bird on the edge of the pyracantha calling for attention every so often. Later, my husband saw the youngster at the far end of the garden and shortly after he saw the adult male blackbird having a real go at a wood pigeon in the same area. Since then, there have been frequent “feed me” calls but there have been no further sightings. 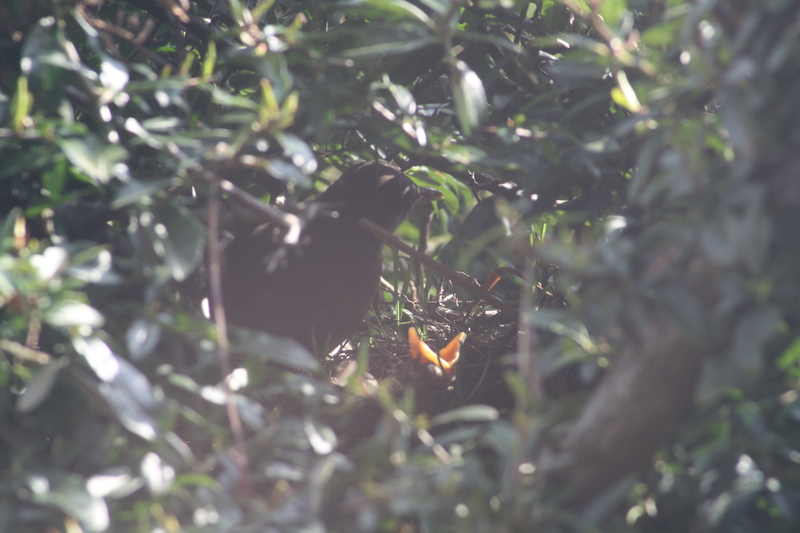 I would think this pair of blackbirds have had three families this season. My son Stephen contributed the final four photos to the post.